Sweden is a wonderful place to live, with a great reputation across the world in all sorts of positive areas. They have one of the most environmentally friendly outlooks in the world and are known as a very welcoming and friendly people. In the technology world they are often thought of as the home of the now defunct infamous digital content index – The Pirate Bay. There’s a reason that Sweden was a logical place for such a repository to be established there because it has a proud history of protecting people’s privacy. In fact Sweden was the first country to enact a comprehensive statute designed to protect the privacy of personal data, the 1973 Data Act. There were already personal freedoms relating to these issues in the Swedish constitution, they are among the world’s trailblazers in protecting personal data. So Sweden is a great place which has comprehensive laws to protect your privacy, which is great if you’re in Sweden but how can others benefit from this protection? Well one answer is to invest in a VPN service which has servers based in Sweden. This will allow you to route your internet traffic through the country and effectively have a Swedish IP address. It’s great for privacy and security, plus useful for all those millions of Swedish expats across the world. Using a Swedish VPN means that they will be able to access resources based in their home country like SVT Play irrespective of their actual location. 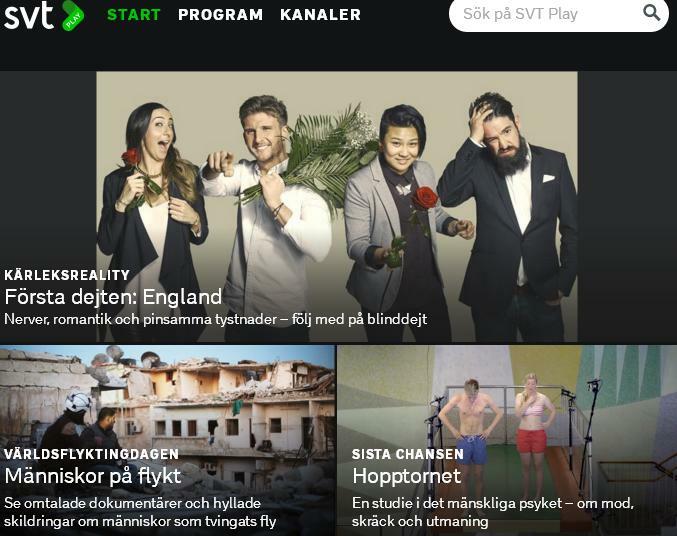 It’s actually the on-demand service run by Sveriges Television and is one of the most popular websites in Sweden. However the site is also geoblocked meaning that no-one outside the country can get access to it. However the technology works on your IP address so that means that if you change your IP address to a Swedish one then you’ll be able to access from anywhere. The best way to do this, is through a VPN service that has servers based in Sweden. A few of the main VPN companies have these, although they do vary in quality. 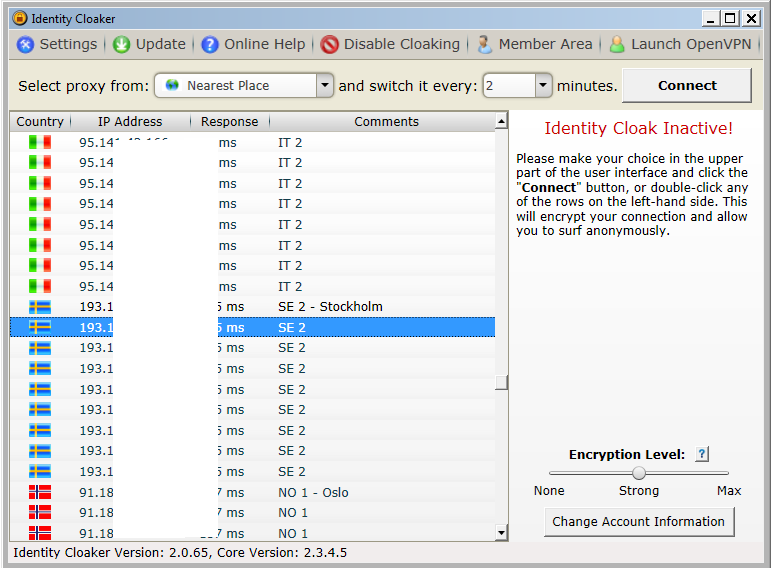 The service we usually use is called Identity Cloaker and has several Swedish servers available to use as part of their standard package. Here you can see the Swedish servers in the Identity Cloaker software, this is the PC version which sits in your taskbar. The concept is simple you simply choose the country you wish your IP address to be located in – selecting one of the Stockholm servers will give you an IP address originating in Sweden. This will allow you to bypass the SVT Play restrictions and watch their site as normal. The benefit of these sort of services is that your location will no longer restrict what you can do online. If you want to watch the BBC then choose a UK based server, for Hulu or US Netflix just pick one in the US – for Irish sites choose one of these. It’s incredibly liberating especially if you’re in somewhere remote where access to the world’s biggest media sites is not normally possible. The VPN completely hides both your location and your real IP address. If you use a Swedish VPN server you’re also protected to some extent by the strong Swedish privacy laws as the server is physically located in Swedish data centre. If you’re particularly concerned about privacy then it’s generally best to use a European service perhaps in France for example to be covered under the EU’s strong privacy laws. However it should be noted that Identity Cloaker delete all log information anyway. If you are trying to access geo-blocked websites then you’ll have to select a server in the country that has access. Remember though, there will be some latency if you connect to servers on the other side of the planet however this is usually negligible. You can test it out here – IDC, for a few Euros.